It is the “season of thanksgiving (gratitude)” and over the past decade, research has identified the social, psychological and physical health benefits that come from giving thanks. One study found that grateful people are more likely to help others, exercise and complete their personal goals. They also tend to be more determined, optimistic, more alert, and have energy and enthusiasm. The word gratitude is derived from the Latin work gratia, which means grace, graciousness, or gratefulness. Gratitude is a thankful appreciation for what an individual receives, whether tangible or intangible. With gratitude, people acknowledge the goodness in their lives. Gratitude helps people feel more positive emotions, relish good experiences, improve their health, deal with adversity, and build strong relationships. I’m actively involved in Circles of Franklin County. Circles’ mission is to inspire and equip families and communities to resolve poverty and thrive. We do that through crisis management and stabilization; education, job placement and job retention; and advancement and economic stability. During the initial 12-week training, Circle Leaders (individual or family in poverty) keep a gratitude and dreams journal. The journal helps them to record what they are thankful for and allows them to eventually become more positive and successful. Also, most Circles’ events begin with an opportunity to go around the circle and for each person to tell their first name and share one thing that is “new and good”. Our culture as a whole tends to focus on problems and what is not going well. “New and good” is a way to celebrate the good in one another’s lives and it is a way to practice being in charge of where we put our attention. We tend to focus on the problems in our life – not the positive. Write a thank-you note. This seems to be a lost art, but I know many people who still do this. You can make yourself happier and nurture your relationship with another person by writing a thank-you letter expressing your enjoyment and appreciation of that person’s impact on your life. Make a habitat of sending at least one gratitude letter a month. Keep a gratitude journal. Make it a habit to write down or share with a love one thoughts about the gifts you’ve received each day. Count your blessings. Pick a time every week to sit down and write about your blessings – reflecting on what went right or what you are grateful for. Sometimes it helps to pick a number, such as three to five things that you will identify each week. Pray. People who are religious can use prayer to cultivate gratitude. Meditate. Mindfulness meditation involves focusing on the present moment without judgment. Focus on what you’re grateful for. 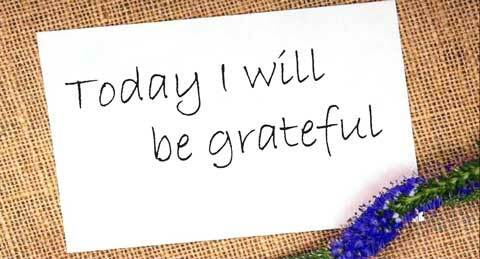 Until it becomes a habit, being grateful must be a conscious decision. Remember that if you live a positive, grateful life, you will attract positive, grateful people. Making your life full of gratitude can only bring happiness. Rebecca McFarland is the Frontier Extension District family and child development agent. For more information, she can be contacted at Frontier Extension’s Ottawa office, 1418 S. Main, Suite 2, Ottawa, KS 66067, or call 785-229-3520, or email [email protected].